A. elegantissima: clonal anemone with radiating lines on oral disk, up to 8 cm across tentacular crown (generally smaller than A. sola). Column is greenish to white in color, often covered with shell debris. Tentacles are greenish to pinkish in color (Morris et al. 1980). A. sola: solitary anemone with radiating lines on oral disk, up to 25 cm across tentacular crown (generally larger than A. elegantissima). Previously thought to be the same species as A. elegantissima, but now recognized as a sibling species (Pearse and Francis 2000). Small individuals located relatively close together can be confused with A. elegantissima and the two species have been grouped together for Long-Term Monitoring. 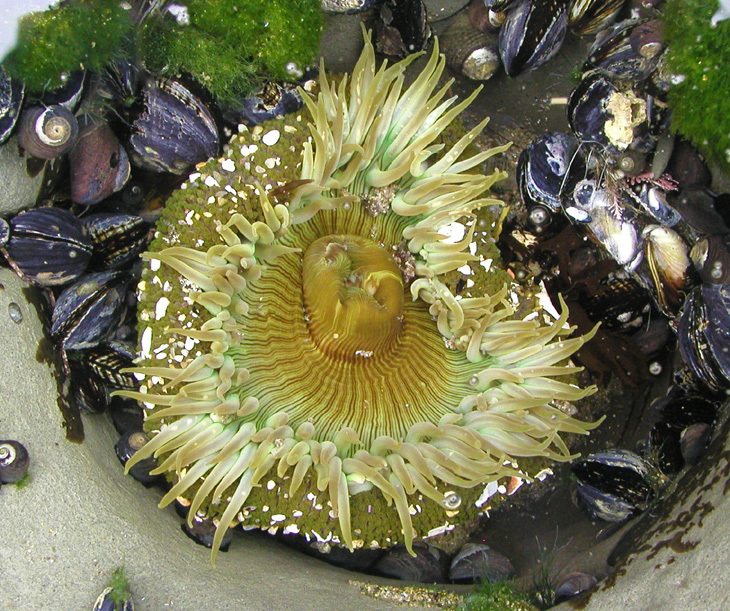 Anemones are abundant on rocks, in tidepools or crevices, and on pier pilings; they are characteristic of the middle intertidal zones of semi-protected rocky shores of both bays and outer coasts. A. elegantissima ranges from Alaska to Baja California (Morris et al. 1980) and A. sola from central California to Baja California. Anthopleura xanthogrammica has a solid green oral disk and a firmer column when withdrawn. It also has small, closely arranged, irregularly shaped tubercles on the column (in contrast to A. sola, which has prominent rounded bumps arranged in rows). A. xanthogrammica has a tighter oral sphincter muscle than A. sola. Previously thought to be a single species, Anthopleura elegantissima and Anthopleura sola were described as genetically, ecologically, and developmentally distinct by Pearse and Francis (2000). While the two species are similar in appearance, A. sola grows larger (to 25 cm) and is solitary compared to the smaller (to 8 cm) A. elegantissima, whose clones are typically aggregated. Anthopleura elegantissima is able to persist practically indefinitely and in great abundance under normal conditions because genetically-identical individuals are periodically produced by longitudinal fission (Sebens 1982). Non-clonemates are spatially separated after aggressive stinging battles. Anthopleura sola does not divide and can be confused with A. xanthogrammica, which occurs south of Point Conception only in areas up upwelling. The three species of Anthopleura typically host symbiotic unicellular algae (zooxanthellae and/or zoochorellae) that can contribute to their overall energy budget (Muller-Parker and Davy 2001). The symbiotic algal type present within a given anemone depends on a number of factors, including light condition, tidal height, and temperature (Verde and McCloskey 2007). At latitudes south of 38˚N, zooxanthellae are the exclusive symbionts in Anthopleura species and the green color of most individuals is due to pigments produced by the animal itself, not the alga (which is golden-brown in color) (Secord and Augustine 2000). Above 38˚N, symbiotic zoochorellae increase in abundance northward, and are responsible for the “grass green” anemones found in low light conditions, such as dimly lit caves (Secord and Augustine 2000, Pearse 2007). Both A. sola and A. elegantissima are abundant on semi-protected rocky shores. 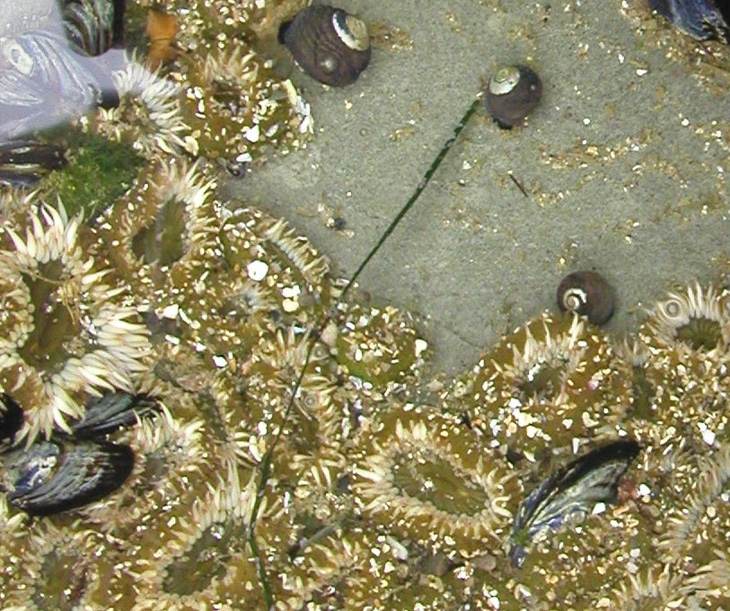 A. sola is common in tidepools and subtidally, and A. elegantissima often occurs as small densely aggregated clones in middle intertidal zones, especially sand-influenced habitats (Morris et al. 1980). Extensive carpets of these clones may occur, but often go unrecognized under low tide conditions because the anemones contract to small blobs covered with sand and shell fragments that provide protection from desiccation. Anemone mats create a moist microenvironment that allows the development of some other species, such as coralline algae and sand tube worms (Phragmatopoma californica) at higher intertidal levels than they would normally occur (Taylor and Littler 1982). Anthopleura species are quite resistant to disturbances from shifting sands (Raimondi et al. 1999). They not only withstand moderate sand abrasion, but also resist shallow sand burial by extending their columns to re-expose the tentacles and oral disk. If buried deeper, they can survive for at least 3 months by metabolizing body tissue (Sebens 1980). Anthopleura spp. are not known to be unusually sensitive to oiling. Recovery from major disturbances may take 1-2 years or more (see Vesco & Gillard 1980).